C is the widely used language. It provides many features that are given below. C is a simple language in the sense that it provides a structured approach (to break the problem into parts), the rich set of library functions, data types, etc. Unlike assembly language, c programs can be executed on different machines with some machine specific changes. Therefore, C is a machine independent language. Although, C is intended to do low-level programming. It is used to develop system applications such as kernel, driver, etc. It also supports the features of a high-level language. That is why it is known as mid-level language. C is a structured programming language in the sense that we can break the program into parts using functions. So, it is easy to understand and modify. Functions also provide code reusability. 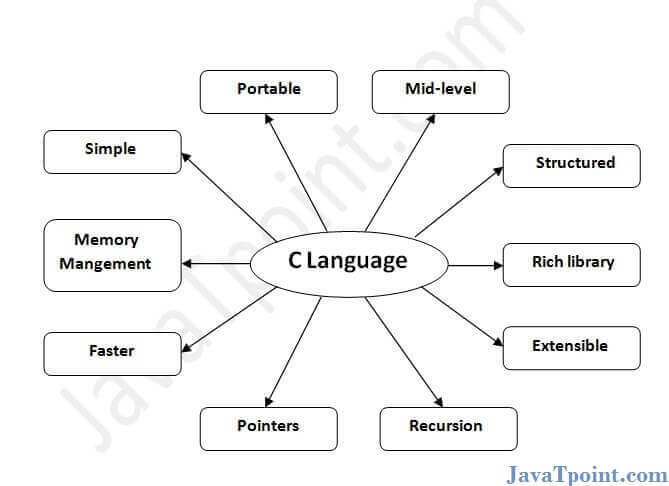 C provides a lot of inbuilt functions that make the development fast. The compilation and execution time of C language is fast since there are lesser inbuilt functions and hence the lesser overhead. C provides the feature of pointers. We can directly interact with the memory by using the pointers. We can use pointers for memory, structures, functions, array, etc. In C, we can call the function within the function. It provides code reusability for every function. Recursion enables us to use the approach of backtracking.